We are literally about half a point from seeing the US Dollar break its single most important support level. 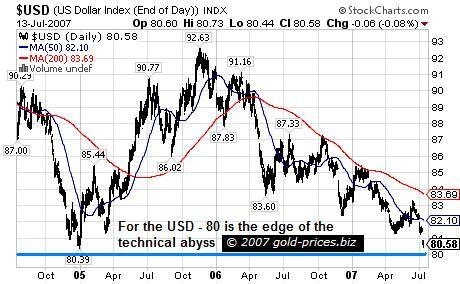 Here, eighty is the magic number, watch the USD fall below 80 and you have witnessed the beginning of the end of the dollar and the dawn of a terrific run in gold prices that will take the yellow metal to an all time high in a surprisingly short period of time. Over the last year, as the chart below demonstrates, we have watched the dying dollar make lower lows and lower highs. The USD occasionally makes a pathetic attempt to break its 200dma, but that has only happened a couple of times over the last year. 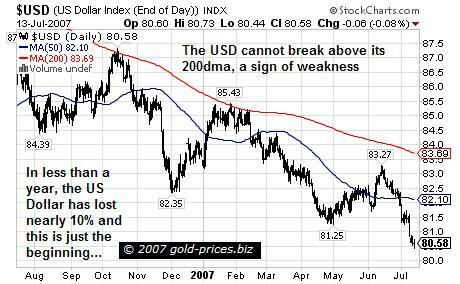 Indeed, the USD has not been above its 200 day moving average since the 50dma crashed down through the 200dma in early April 2006. The USD has fallen over two points in the last fortnight or so, and this rate of decline will continue if it breaks the support level at 80. When the USD was testing this support at the beginning of 2005, it went on a terrific run to 92.63 but somehow we do not think that the dollar will be able to pull another rabbit out the hat as it did then. More and more investors are coming around to the fact that the USD is dead and people do not want to hold this rapidly devaluing paper anymore. When the USD breaks 80, the whole world will see a big sell signal and this influx of people dumping dollars will send the greenback down into the abyss and its anyone’s guess how far it can fall, but it will fall…a lot. However there is one fan of the USD, a fan that will try and keep the dollar up or at least “manage�? its invertible collapse. That of course is the US Government. Armed with Ben Bernanke’s Plunge Protection Team, you can bet you bottom dollar (although shortly it might not be worth much) that they will do everything possible to make sure their currency does not have a full blown crash. They would rather that USD gradually floated down in a way that would benefit US exporters. Trying to manipulate the market is a dangerous game, as no person, company or government is bigger than the market and eventually the market will fight back and win. In fact the more an entity tries to suppress something, whether this be the financial market or something as simple as an idea, the more drastically the suppressed force will fight back. Therefore all the Plunge Protection Team are doing by trying to prop up the dollar or the stock market is delaying the invertible and making the backlash reaction all the more dramatic. You can try to push the bad times back, but this will just make the bad times worse when they eventually come around. It is crucial to remember that the United States on America is not the only government with an interest in which way the dollar goes. With their hands on over $1.2 trillion dollar bills, the Chinese Government must also be watching the USD like hawks having lost $100 billion of value in less than a year. The government in China is very concerned at keeping “social unrest�? at a minimum so how do you think the Chinese people will react if the USD continues declining further and further down bringing their foreign currency reserves closer and closer to worthlessness. China must be looking to transfer their dollars into something that retains its value or perhaps even increases in value, after all isn’t that what investments are supposed to do? China will look to get out of dollars and into anything that isn’t falling as fast as the USD. The private equity group Blackstone, made the biggest US IPO of the year recently and Beijing swiftly swooped in and bought a 9.9% stake in the company, using $3 billion of its foreign exchange reserves. It is likely that we will see more examples like this of China buying companies, commodities and whatever they can to get out of the dollar. Gold and silver bullion or the mining companies in the precious metals industry are obvious candidates for a piece of China’s USD pie as they move up and as the greenback moves down so they are the most logical hedge against a declining dollar. If China and other countries holding large USD reserves shift even a small proportion of their dollars into the precious metals, it will have massive effect on gold prices and silver prices. Governments aside, individuals around the world will be looking to trade any dollars they have for a piece of gold or some gold stocks rapidly increasing in value. So do we think the USD will break 80 in the next few days? No. The PPT will probably buy it back up a couple of points but then it will drift down again to test the eighty level and will probably break it in the coming months. However now is the time to buy gold and silver and gold stocks and silver stocks. For ideas on which gold stocks to invest in, subscribe to the Gold Prices newsletter at www.gold-prices.biz completely free of charge. DISCLAIMER: Gold Prices makes no guarantee or warranty on the accuracy or completeness of the data provided on this site. Nothing contained herein is intended or shall be deemed to be investment advice, implied or otherwise. This website represents our views and nothing more than that. Always consult your registered advisor to assist you with your investments. We accept no liability for any loss arising from the use of the data contained on this website. We may or may not hold a position in these securities at any given time and reserve the right to buy and sell as we think fit.